Molasses being made during the Country Fall Festival last year. Every fall festival needs some fresh apple cider available. This blacksmith demonstrated a lost art form during the Country Fall Festival last year. 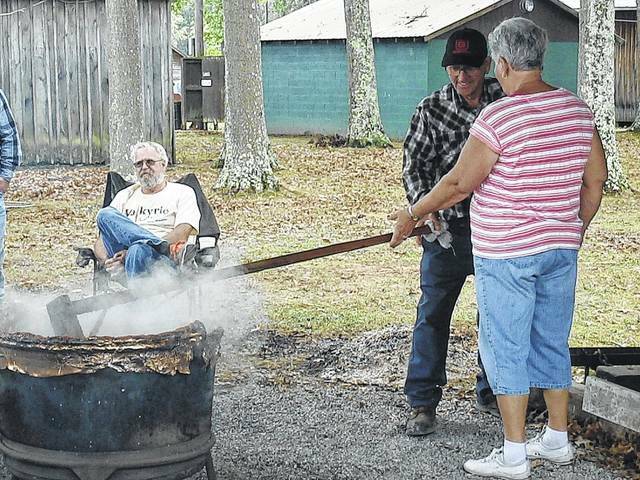 Country Fall Festival goers are able to make their very own apple butter during the festival. 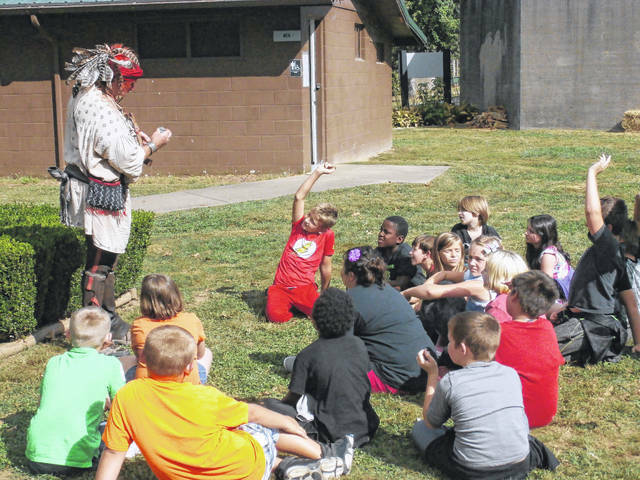 Students listening intently while “Chief Cornstalk” speaks with them during Battle Days last year. Local fourth graders were able to take a ride through downtown Point Pleasant in a horse-drawn carriage during the Battle Days celebration last year. Students were taught about musical heritage by the dulcimer group during Battle Days last year. Students were able to watch Native American dancing during the Battle Days celebration last year. POINT PLEASANT — The first weekend in October will offer local residents and visitors a way to celebrate the days past with the Battle Days and Country Fall Festival. To kick off the weekend, Battle Days will start on Friday, Oct. 5 and continuing into Saturday and Sunday. Battle Days will celebrate the 242nd anniversary of the Battle of Point Pleasant which occurred on Oct. 10, 1774. Events take place at Tu-Endie-Wei State Park. The Pipes and Drums of St. Andrews performs at 11:30 a.m. at the park. The elementary school chorus will start singing at noon, and at 1 p.m. several events will start, including: an Anne Bailey reenactor, a Chief Cornstalk reenactor, and Colonial Games (for kids); at 1:30 p.m. a Daniel Boone reenactor will be on hand along with a group playing era-correct music on dulcimers. Starting at 2 p.m. Bill Hawkins, a guest author will be making a presentation and will do a meet-and-greet with the public from 2-4 p.m.; Anne Bailey will return at 2 p.m; Chief Cornstalk will return at 2:30 p.m.; and Daniel Boone again at 3 p.m. Then at 4 p.m. a performance by the Kootaga Indian Dancers. At 6 p.m. there will be a Colonial Governor’s Reception at Sacred Heart Catholic Church for Sons of the American Revolution members only. The evening will end with the Colonial Ball at Sacred Heart Catholic Church from 8-10 p.m which is free for the public and open to anyone ages 13 and up. Colonial dress is encouraged but not required. Sunday, Oct. 8, will feature an outdoor early colonial church service at 10 a.m. at the park. Also on Sunday, a memorial service for the fallen soldiers at the Battle of Point Pleasant will start at 2 p.m. at Tu-Endie-Wei State Park. The public is invited. There will be a wreath-laying ceremony during the memorial service. The Mansion House Museum will be open from 1-4:30 p.m. that day as well. Admission to the actual Battle Days festival at the park, is free. 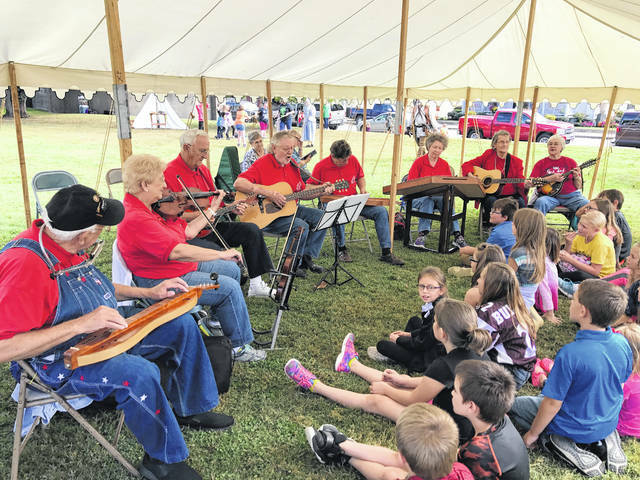 Just north of Point Pleasant, the County Fall Festival will be taking place Oct. 6-7 at the West Virginia State Farm Museum. There will be an Antique Gas Engine Show and an Antique Tractor Pull Saturday at 1 p.m., CEOS Quilt Show all weekend long, Antique Bottle Show and Sale from 9 a.m. to 2 p.m, Saturday, musical entertainment, a church service on Sunday at 9 a.m., Gospel Sing on Sunday at 1:30 p.m., and the Country Store and Country Kitchen will be open. There will be fun and games for the entire family. In addition, there will be molasses and apple butter making — both will be sold while supplies last. There will also be apple cider as well as vegetable soup cooked over an open flame for sale. There will also be demonstrations and exhibits open to all. The 32nd annual Harvest of Quilts show, featured during the festival, is hosted by the Mason County Community Educational Outreach Service (CEOS) members. All quilters are invited to exhibit a quilt in four categories — Large Quilts (hand quilted), Large Quilts (machine quilted), Small Quilts (hand quilted), Small Quilts (machine quilted). There is another category which was added in the past two years for those who don’t have the time or desire to make a bed size quilt or wall hanging. The theme for this year’s exhibit is “vintage,” and for those who are not entering an entire quilt, they may enter a “vintage” style block. Quilts will not be judged but the visitors to the show will be asked to vote on their favorite in all categories. There will be handmade ribbons given to first and second places and an Honorable Mention ribbon for third place. The Antique Bottle Show and Sale, organized by local Charlie Perry, will feature milk bottles, stoneware, advertising, beer, soda machine, druggist, paper items, Coca Cola, Pepsi, small antiques, fruit jars. Free appraisals. All weekend long, visitors can tour the grounds of the museum, taking in everything from a one-room schoolhouse to a blacksmith shop. The Christopher H. Bauer Memorial Museum, which opened in 2015 at the museum, features trophy and exotic animals, along with a display of unique firearms, knives and hunting tools. Parking and admission into the festival is free, but donations are welcomed and appreciated. 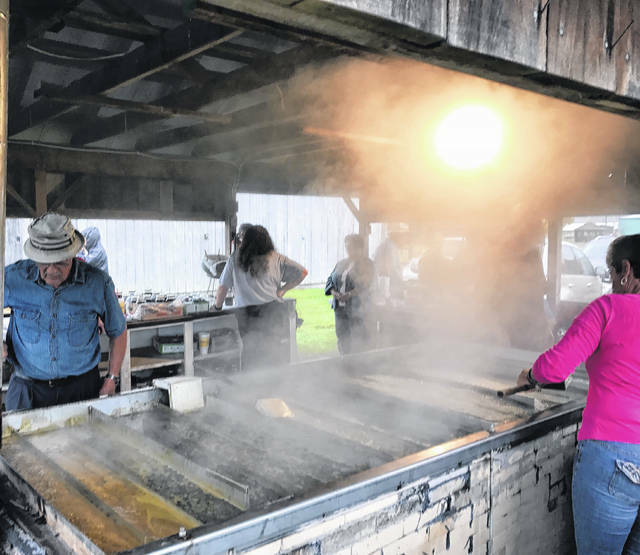 https://www.mydailytribune.com/wp-content/uploads/sites/42/2018/09/web1_10.10-CFF-1.jpgMolasses being made during the Country Fall Festival last year. 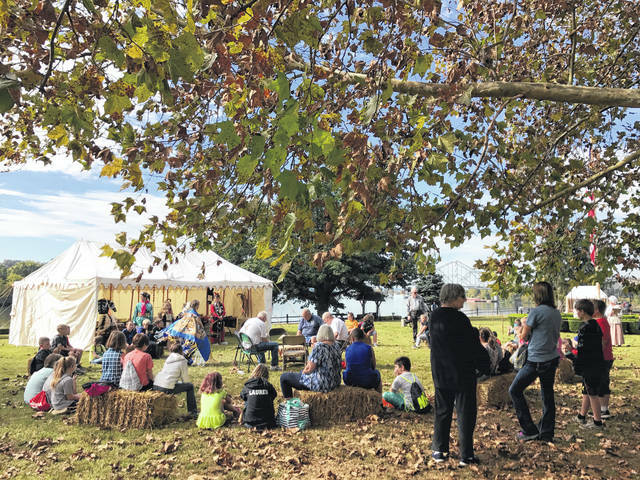 https://www.mydailytribune.com/wp-content/uploads/sites/42/2018/09/web1_10.10-CFF-3.jpgEvery fall festival needs some fresh apple cider available. 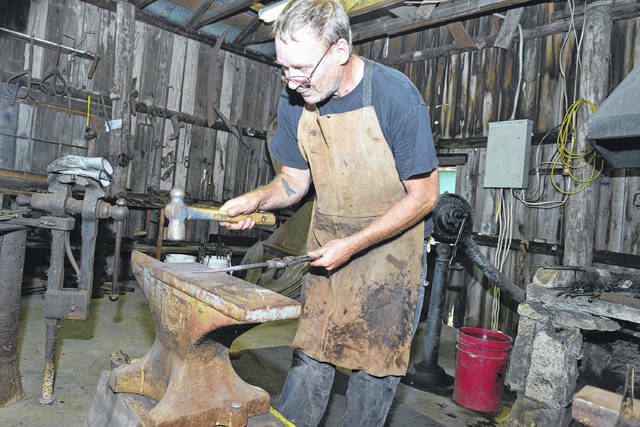 https://www.mydailytribune.com/wp-content/uploads/sites/42/2018/09/web1_10.10-CFF-5.jpgThis blacksmith demonstrated a lost art form during the Country Fall Festival last year. 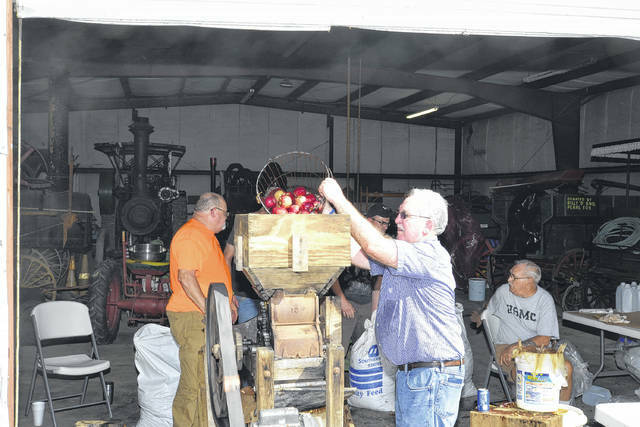 https://www.mydailytribune.com/wp-content/uploads/sites/42/2018/09/web1_10.4-PPR-CFF-2.jpgCountry Fall Festival goers are able to make their very own apple butter during the festival. https://www.mydailytribune.com/wp-content/uploads/sites/42/2018/09/web1_10.7-PPR-Battle-12.jpgStudents listening intently while “Chief Cornstalk” speaks with them during Battle Days last year. 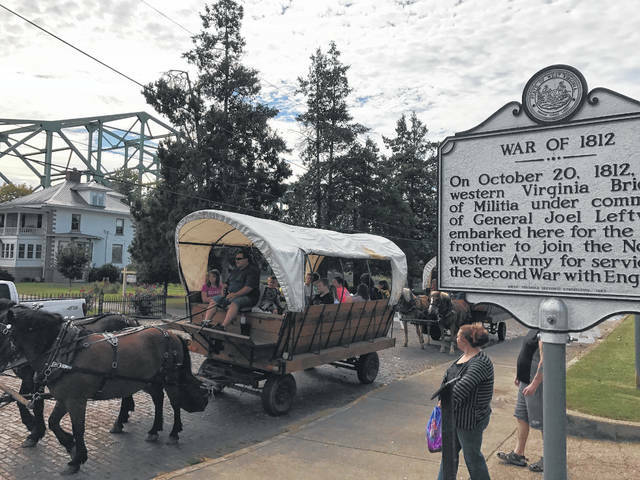 https://www.mydailytribune.com/wp-content/uploads/sites/42/2018/09/web1_10.7-PPR-Battle-5.jpgLocal fourth graders were able to take a ride through downtown Point Pleasant in a horse-drawn carriage during the Battle Days celebration last year. https://www.mydailytribune.com/wp-content/uploads/sites/42/2018/09/web1_10.7-PPR-Battle-7.jpgStudents were taught about musical heritage by the dulcimer group during Battle Days last year. https://www.mydailytribune.com/wp-content/uploads/sites/42/2018/09/web1_10.7-PPR-Battle-8.jpgStudents were able to watch Native American dancing during the Battle Days celebration last year.